As the desire to utilize solar energy grows, so does the need for a convenient, SolaDeck is a virtually unnoticeable enclosure to penetrate the roof deck. SolaDeck both houses and protects the solar PV wiring for a fast, easy and safe photovoltaic wire installation. Contractors can now install solar panel wiring with consistency, time savings and confidence every time. 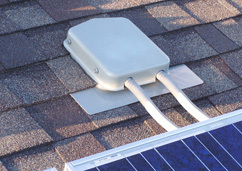 Unlike other solar array wiring enclosures, SolaDeck incorporates a unique flashing that is a seamless part of the enclosure and prevents incorrect penetration of the roof. Maximize your installation confidence by using SolaDeck.